•Keep your garage, shop, and office neatly organized with heavy-duty magnetized labels for metal shelves, file cabinets, any most any flat metal surface. Think of them as "mobile labels for metal." 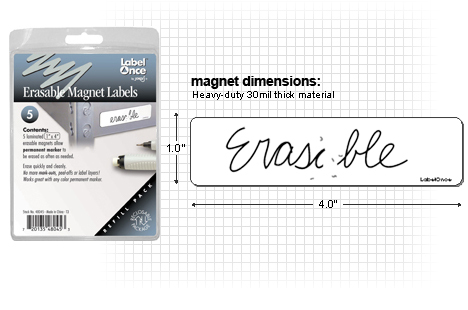 MFG-48045 CONTENTS: CONTENTS: 5 erasable heavy-duty magnets 1"x 4" (no marker or eraser) packaged in a reclosable clamshell.